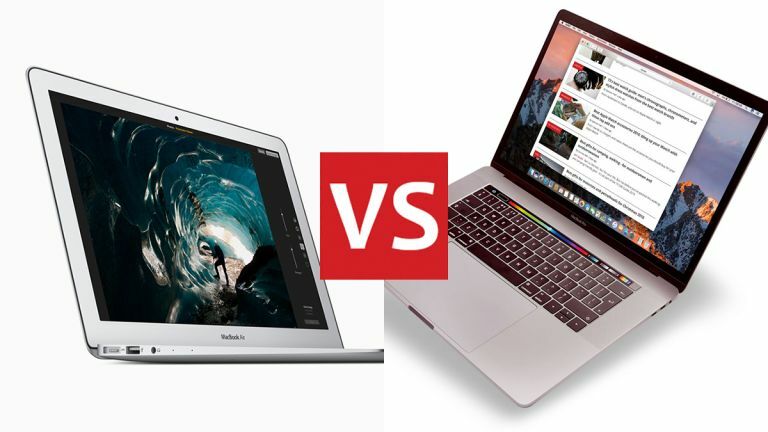 Macbook Air vs Macbook Pro: which Apple laptop is right for you? Have a click around the Apple website and you might be surprised at just how many laptops the company sells – you've got MacBooks, MacBook Airs and MacBook Pros to consider, and it's not always obvious what the various specs and features are of each. We're here to help demystify some of the buying process by putting Apple's oldest laptop, the MacBook Air, up against the newest laptop in the range, the MacBook Pro. By the time you've finished reading you should have a much better idea of where to spend your cash. The MacBook Air is now a full 10 years old and hasn't changed its looks in all that time – so credit to the original designers, because it still holds up pretty well, even by today's standards. Other laptops are thinner these days, but it's still very svelte and slimline. Perhaps the most jarring aspect of the MacBook Air's design is the sight of those thick bezels around the screen, which really do look like they've come from 2008 rather than 2018. Still, the computer is a pleasure to type on and use, is easy to lug around, and has all the styling you'd expect from Apple. The MacBook Pro is a much more modern-looking machine, and features a huge trackpad as well as that Touch Bar on some models – allowing you to use Touch ID to access macOS, pull up extra controls for media playback and image editing apps, and so on. It's pretty close in terms of aesthetic appeal here, and we'd say that neither of these laptops are going to disappoint you when they're sat on your desk or lap, but the MacBook Pro probably just edges it thanks to its more recent stylings. You can fit out these laptops with various different configurations on the Apple website, but there's no doubt the MacBook Pro machines have more grunt overall. The Pros are machines that really can do anything, just about. The Air has had several spec boosts down the years, most recently to fifth-generation Intel processors. The ones inside the MacBook Pros are seventh-generation though, meaning better efficiency, improved power, and less of a draw on battery life. As for RAM, 8GB is your only option on the MacBook Air, coupled with 128GB, 256GB, or 512GB of storage. That's actually going to be plenty for most users, but the MacBook Pro models give you the option of upping the RAM to 16GB and the internal storage to 2TB. The integrated graphics chips are significantly faster on the Pros as well. Then there's the display – the MacBook Air's 13.3-inch, 1440 x 900 pixel display is looking decidedly dated. The MacBook Pros earn a Retina badge, starting at 13.3-inch, 2560 x 1600 pixel models and going up to 15.4 inches and 2880 x 1800 pixels. We've already spoken about the Touch Bar that comes as standard on the 15.4-inch MacBook Pros and as an option on the 13.3-inch models. It's the most obvious difference between these two laptops if you were taking a quick glance at them. If you need older USB ports, the MacBook Air is the laptop to go for, as it has two. The newer MacBook Pros make use of the newer USB-C ports, which are all Thunderbolt compatible too – you can get two or four of them, depending on your configuration. One benefit that slower components gives you is better battery life: the MacBook Pro laptops are rated for 10 hours of web browsing or video playback, while the MacBook Air goes all the way up to 12. Finally, there's the software, and both the MacBook Air and the MacBook Pro ranges will happy run the latest version of Apple's desktop OS, macOS High Sierra. That gives you access to all the bells and whistles of the newest software, plus all of Apple's free apps covering emails, web browsing and office tools. In terms of looks, power, modernity, display, and just about everything else, the MacBook Pros beat the MacBook Air. So why might you still want to pick up one of the laptops that Apple first launched in 2008? Price might be one reason – the Air remains the cheapest laptop Apple sells, starting at £949/$999. Compare that with the Pro line, which starts at £1,249/$1,299 and then goes up very sharply from there. We've already mentioned the MacBook Air's superior battery life, and it's lighter than the MacBook Pro too, thanks to the less powerful components inside it (though if lightness is a priority for you, have a look at the MacBook too). Slightly lighter and slightly cheaper, the MacBook Air could still tempt a few buyers. But we reckon the MacBook Pro is worth the extra expense for most users, giving you far more configuration options, like the choice of a bigger screen and a Touch Bar.